In 2016 we were proud to become the first ITS solution providers to have real-time journey information from the National Traffic Operations Centre (NTOC) displayed on VMS, improving the commuter’s journey experience. We are proud to say that as well as being the first to offer this pioneering solution, we fully comply with Highways England’s (HE) stringent criteria. 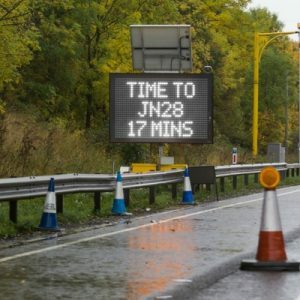 Our NTIS DATEX II Portable Travel Time VMS (TTVMS) was created in partnership with HE as part of its Travel Demand Management (TDM) pilot for use on its Manchester Smart Motorway (MSM) initiative. It’s since gone on to feature in HE’s largest scheme, the £1.5bn A14 Cambridge to Huntingdon upgrade. Displaying journey times on 26 portable Bartco VMS, the system helps inform 85,000 drivers on average each day of their predicted journey time, assisting them to choose a different route. During the MSM project, HE issued its supply chain with a new Major Project Instruction, MPI-54-062016, ensuring that schemes of longer than 4km must not only display TTVMS legends on portable VMS to let customers know the travel time to the end of the works, more importantly that consistency is achieved between the information displayed and Strategic Road Network (SRN) fixed VMS. The data we use is provided by the National Traffic Information Service (NTIS), which validates all data collected from GPS probe devices, ensuring quality and accuracy by comparing the measured journey times and speeds with ANPR and MIDAS data. Compared to fixed traffic monitoring devices such as ANPR to generate journey time information, there are many advantages to using data from in-vehicle GPS devices, allowing real time monitoring and low latency, granularity of traffic data, improved coverage and less roadside equipment.